The company issued a voluntary recall involving both Hill's Prescription Diet and Hill's Science Diet canned foods on Jan. 31, warning of a potential for elevated levels of vitamin D which could lead to health issues, including vomiting, loss of appetite, increased thirst, increased urination, excessive drooling and weight loss. 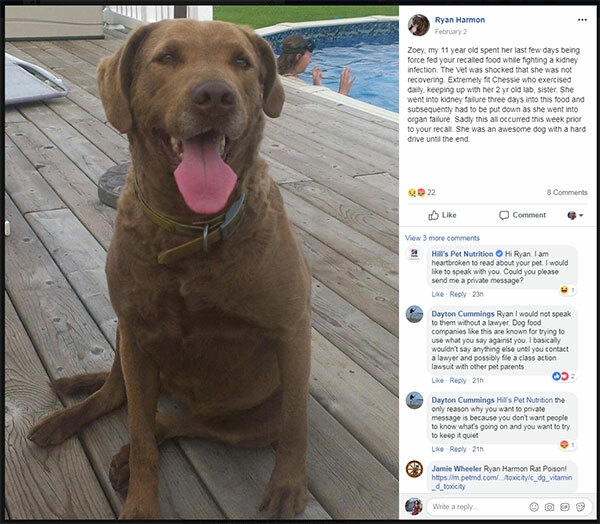 Since the recall was announced, dozens of people have responded to Hill's original post on Facebook saying either their dogs have become sick or have died, many asking for compensation to recover thousands of dollars in veterinary care. The company, meanwhile, is responding to those posts asking to speak with the customers through private messages. In other cases, the company told customers the vitamin D came from an unnamed supplier in Texas and was manufactured in Topeka, Kansas. "First and foremost, we’re heartbroken about this situation, which involves a limited quantity of our canned foods, and we are taking it very seriously. Hill’s people are working with pet parent to listen to their concerns. As pet parents ourselves, we understand the gravity of health issues with our pets. We have extended our call center hours and tripled the number of people on our phones, so we can take time with every pet parent. Additionally, our team of veterinary professionals is engaged with vet hospitals and clinics to respond to their questions. It is important to keep in mind that vitamin D toxicity is actually very rare. In rare cases, continuous consumption of high levels of vitamin D can result in serious health issues, so we are assessing every pet parent inquiry thoroughly. We have identified and isolated the issue, which is restricted to a specific vitamin mix, provided by one of our suppliers in the U.S., that was used in limited production of canned dog food as listed on our website. To prevent this from happening again, we now require the supplier of our vitamin mix to conduct additional quality testing on every batch of this ingredient delivered to Hill’s. In addition, we are also strengthening our own testing protocol for incoming ingredients as an additional safeguard. We appreciate people's patience as we take the time needed to assess the concerns of each and every pet parent. We are committed to providing safe, high quality foods to all pets." 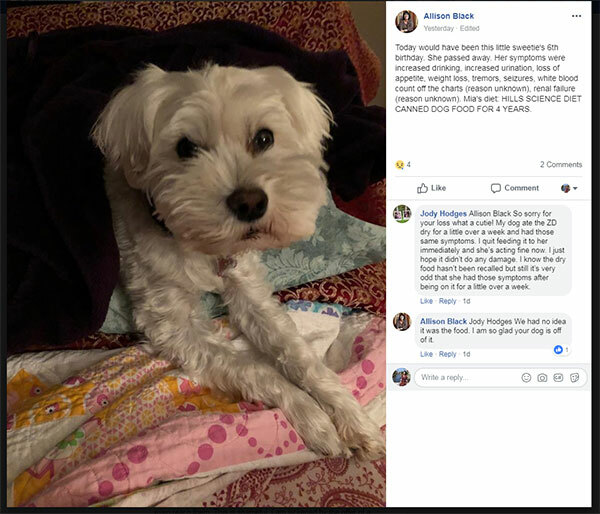 Meanwhile, in response to a customer on Twitter, Hill's Pet Nutrition said, "We have identified and isolated the supplier error and, are now requiring them to implement additional quality testing prior to release of ingredients. In addition to our existing safety processes, we are adding our own further testing of incoming ingredients." 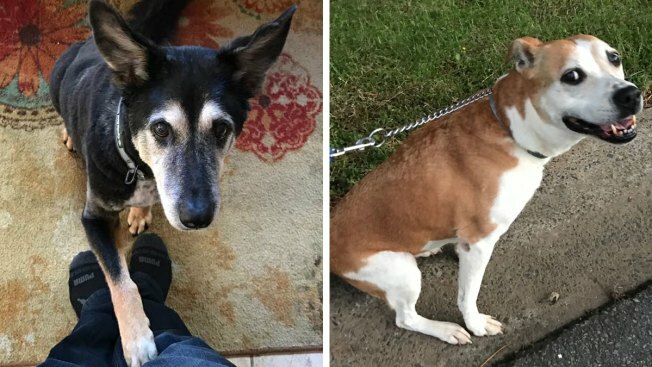 Allison Black says her dog Mia died after showing signs of renal failure. 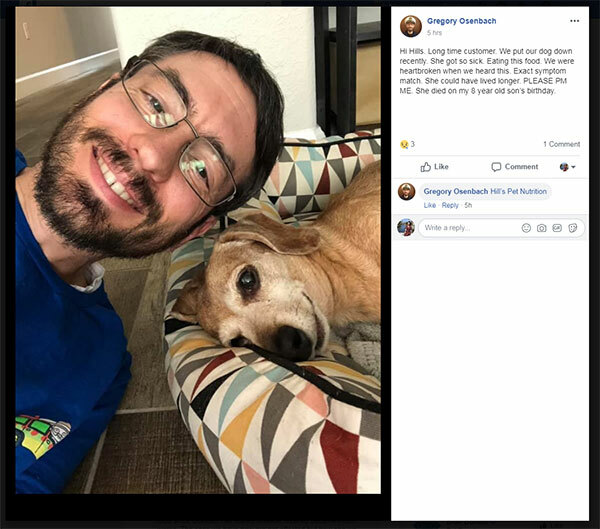 Gregory Osenbach says his dog died after showing all the warning signs for elevated levels of vitamin D.
Ryan Harmon says his dog Zoey spent her last few days being force fed recalled dog food while fighting a kidney infection. For a list of the recalled foods, click here. If your dog has consumed any of the recalled products or is showing any of these signs, contact your veterinarian immediately.